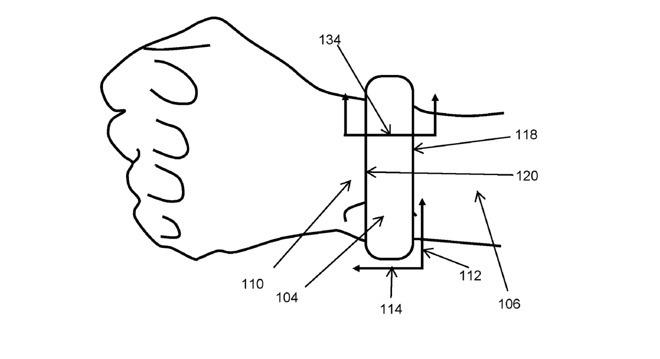 Apple on Thursday was granted a patent for what appears to be a blood pressure-measuring device that connects to existing Apple devices. "The system includes an expandable member or structure that has a multi-compartment structure and/or is mounted on a rigid surface or structure," reads the patent, issued from the U.S. Trademark and Patent Office. "The system is incorporated into a portable multi-function device, or is configured to communicate with a portable multi-function device." Photos attached imply that the "portable multi-function device" referenced is the Apple Watch. The product, should it come to fruition, would be Apple's first full-on medical device, and subject to US Food and Drug Administration oversight, which it has been reluctant to do. However, Apple has gotten much more ambitious about health-related software applications in recent years. The patent application, titled "Cuff Designs and Methods" is credited to six Apple employees, with it filed in June 2016. Apple launched HealthKit in 2004, and has continued to expand its functionality since. Earlier this year, Apple signed up 12 major U.S. health care providers to support Health Records in iOS, an effort to digitize health records and easily help providers share data while treating patients; that number has since expanded to 39. Earlier this week, Apple opened its Health Records API to developers. Apple had filed a separate patent in October of 2017, for "intelligent blood pressure monitoring," but the new patent is different in at least one respect —it does not contain the word "intelligent." A third-party, HealthKit-compatible blood-pressure monitor, QardioArm by Qardio, is available in Apple's retail stores. And last November, a study found that the Apple Watch can be used to detect such conditions as sleep apnea and hypertension.